Jordy Maree posted the best result of a strong Saffa contingent in the first QS event to be held in West Africa, the Senegal Pro presented by BKS, where he placed equal third. A QS1,500 rated event for men and women, the Senegal Pro presented by BKS attracted almost 70 international competitors (13 Saffas) with Timothee Bisso (FRA) and Nadia Erostarbe (Basque Country) claiming commanding victories in the finals against Aboubakar Bouaouda (Morrocco) and Emily Nishimoto (JPN) respectively in clean 3ft surf at Surfer Paradise in Dakar. 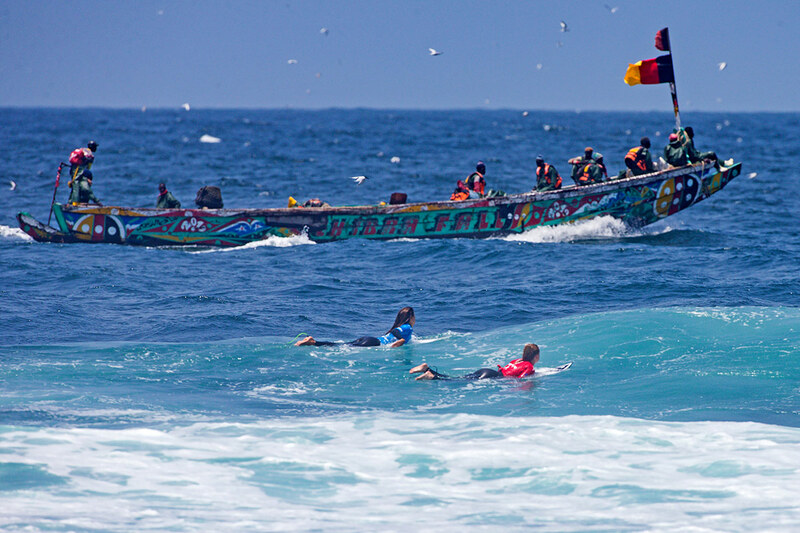 Stop 1 on the 2019 WSL Africa regional QS circuit was graced with beautiful conditions and great performances by the surfers, who included a handful Senegalese surfers. Maree was in form, winning his four-man Round of 32 and Round of 16 heats and then defeating compatriot Dylan Lightfoot (Jeffreys Bay) in their man-on-man quarter-final. Maree was narrowly outpointed by eventual runner-up Bouaouda in their semi-final encounter but his haul of 840 points saw him leapfrog 239 places up the QS rankings list to No 146 where he takes an early lead on the WSL Africa leaderboard. The final started with both surfers posting mid-range scores and at the 10-minute mark they were neck and neck. Bisso, a former runner-up at the World Junior Championship who won his first QS event in Tenerife last month, then re-gained the lead with a 7.50 (out of 10) and closed the door on his Moroccan rival with an excellent 8.25 to claim back-to-back wins in the space of three weeks. The women’s final was also an all-goofy foot battle and Erostarbe was the first to fire with excellent backhand turns right in the lip to put a 6 and a 7 on the board and take an early lead over Emily Nishimoto (JPN) who only recorded average numbers. The Basque surfer continued to build momentum and gained confidence, hitting all the right turns in the right sections and posted a 7.50 to nail her first-ever win on the Qualifying Series. Surfers from Europe will now focus on the men’s QS3,000 Pro Santa Cruz pres. by Noah Surf House from April 8-13, while the next African event will be QS1,000 Nelson Mandela Bay Surf Pro from April 18-20, 2019. The Senegal Pro pres. by BKS ran from March 27-30, 2019 at Surfer Paradise, Dakar - Senegal. For all results, photos, video highlights and press releases, log on to worldsurfleague.com. The Senegal Pro was produced by Surfer Paradise, Blacks Surf and supported by the Fédération Sénégalaise de Surf, Teranga Digital, Smile Wave Fund, Eiffage, Groupe Kirène, la République Française, Icom Groupe and Bonjour Sénégal among others. Please don't say anything you would not say to a real person, and please use your real name.